Back in March, the European Championships delivered some pretty intriguing match-ups. There was Mingiyan Semenov (RUS, world no. 5) throwing a beating on 2008 Olympic bronze medalist Roman Amoyan (ARM) in the finals. Zhane Belenyuk (UKR, 85 kg, world no. 1) took home his first Euro gold, defeating Robert Kobliashvili (GEO, world no. 6). And there was even a highly-entertaining repechage bout at the non-Olympic 80 kg between Rajbek Bisultanov (DEN, world no. 13) and Jarno Aalander (FIN). But the news of that tournament in many’s eyes was a rematch of the 2013 World Championship final between Nikita Melinkov (98 kg, world no. 1) and two-time World Champion Artur Aleksanyan (ARM, world no. 2). They’ve met up a couple of other times, but this match taking place during an Olympic year raised the stakes. Melnikov won that 2013 World final 2-2 on cautions due to Aleksanyan grabbing at his singlet. It was likely a confounding loss for both Aleksanyan and Armenia. Aleksanyan’s singlet-grabbing did not seem to make any discernible difference when it occurred. But it was also tough to ignore. When this match took place in March, Aleksanyan was firmly entrenched at number one in the world rankings with Melnikov holding onto the eighth spot. But at the end of the day, rankings are just for bookkeeping. It’s a paper chase. Terms of conflict tend to get decided between two men on a mat with officials. And that is precisely what happened here. Aleksanyan, the brutish yet surprisingly dynamic athlete who has captured the sport’s imagination at times, was on a mission to prove that he had what it took to make the upcoming Rio Olympics his stomping grounds. Melnikov, on the other hand, looked to be hitting his stride coming out of the Poddubny thanks to his technical focus and refusal to break from a game plan. 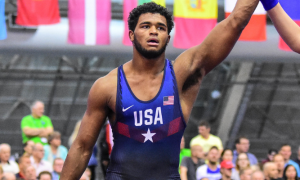 This was a final that had all of the makings of a serious fight between two top Greco Roman wrestlers who might very well be on another collision course towards August. It wasn’t a high-scoring affair. There wasn’t a boatload of action here, either. But a European Championship title on the line along with the names involved were more than enough to elevate this to “can’t miss” theater. Not many athletes find a lot of success controlling ties against Aleksanyan. He is masterful at bringing his feet forward while digging around inside, where he uses his considerable strength to force his way into positions he likes. Melnikov knew he would have to pick his spots and keep fluid, lest wind up being caught off balance and bullied around. It’s not that Aleksanyan was blocking so much. He certainly was blocking a bit. But it was more that he kept tying up the fingers. Given that Melnikov appeared to at least try to create openings, Aleksanyan’s finger-entangling wasn’t going to be let go by the referee. To his dismay, the Armenian was put down in the first par terre chance of the match for Melnikov, who capitalized quickly. That’s a big four-point play so early in a match like this. Melnikov prefers to lock and lift, but that’s usually on opponents who don’t have the same kind of pedigree that Aleksanyan brings to the table. But he went right for it without bothering to risk having his clasp smothered underneath and let the attempt go to waste. So that’s four – count ’em, four points in the first period against the presumptive best wrestler at this weight in the world during the finals of a pretty important tournament. Obviously, being down four in the final period, especially in a weight division where often, the points don’t pile up unless in par terre, Aleksanyan had to get going. As such, the level of physicality increased whenever he’d manage to get looks he liked. The problem? Melnikov repeatedly closed up right away whenever he sensed a threat. Which is why it’s fair to argue that Melnikov could have been knocked for a passivity caution (or two) during this bout, specifically in the second period. A warning to open up seemed like it would eventually lead to one. Aleksanyan began stalking more and more. Melnikov, to his credit, played his role beautifully. He knows how to frustrate. And he knows Aleksanyan’s style. But the 2012 Olympic bronze medalist Aleksanyan couldn’t wait any longer. He reached for a headlock, only there was no grip to be found. His level was just a little high to lasso it properly, resulting in a slip. This was Aleksanyan’s first (and last) big attempt at a game-changing move. Any time the 24-year old caught a snippet of wrist control or burrowed in for a two-on-one, Melnikov had the perfect antidote. He’d break whatever tie Aleksanyan was looking for, move his feet, and re-engage. It was a shrewd strategy to take as time began to wind down. Don’t misunderstand – it was clear that Aleksanyan was trying to work and it was somewhat obvious Melnikov was content not to risk anything unnecessary. But as we mentioned, Melnikov understood how to stymie Aleksanyan and while he should have been put down in this match, you can’t fault a game plan that works. And work for Melnikov it did, as he came away the winner via a 4-0 score. Whether or not these two meet up again for all the marbles, this match is likely one that neither will forget anytime soon. Especially Aleksanyan. This makes it two times now that he has lost to Nikita Melnikov in the most frustrating ways you can. Sometimes, there is just an opponent who just has your number. There might not be enough history between these two to say that for Aleksanyan about Melnikov, but their meeting in March doesn’t help matters much.